Home » Posts tagged with "dairy"
In November 2016, Animal Justice filed complaints with authorities over a misleading ad campaign that suggested that consuming of dairy is essential for human health. The ads, sponsored by the Dairy Farmers of Canada, were crafted to appear as public health announcements by several health organizations, including the Heart and Stroke Foundation, Osteoperosis Canada, and Colorectal Cancer Association of Canada. Disturbingly, the ads told Canadians to consume dairy to prevent osteoporosis, colorectal cancer, and hypertension. Dr. Walter Willet, Chair of Harvard’s Department of Nutrition and Professor of Medicine at Harvard Medical School, observes that high dairy intake is not beneficial and may even be harmful. According to Dr. Willet, high dairy consumption is associated with increased risk of prostate and ovarian cancer. Animal Justice filed false advertising complaints with the Competition Bureau and the Canadian Food Inspection Agency (CFIA)—which are responsible for protecting consumers from fake marketing. Food ads must be truthful so consumers can avoid food fraud and make informed choices. Last year, the Competition Bureau—the federal consumer protection agency—opened an inquiry into the false ads. However, Animal Justice just received bad news—the Commissioner of Competition dropped the inquiry. 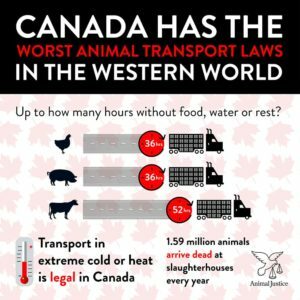 Laws protecting farmed animals in Canada are weak or often don’t exist in the first place. Even when laws offer some protections to animals, they are badly under-enforced. That’s why Animal Justice lawyers get creative to protect animals. We use false advertising laws to crack down on the meat, dairy, and egg industries. We’re dismayed that our legal complaints have not resulted in justice. But we’re not ready to give up. Next, we’ll file requests under freedom of information legislation to find out why authorities fail to act. As long as farmed animals are confined in appalling conditions and food companies get away with lying about their products, we will use whatever legal tools are available to fight for animals. Option 2: banning advertising food to children if it exceeds 15 percent of the daily value of saturated fat, sugars, or sodium. Under option 1, companies couldn’t advertise sugar-sweetened yogurt, cheese (even if calorie-reduced), or ice cream (among other foods) to children under the age of 17. Under option 2, companies couldn’t advertise sugar-sweetened yogurt, most cheese, or ice cream to children under the age of 17. However, they would be allowed to advertise calorie-reduced cheese to children. Tell the government to go with option 1! The dairy industry has successfully duped children and families into believing that cheese, chocolate milk, and sugary yogurt are a healthy and essential part of the human diet. By disguising their marketing as education, Canadian dairy lobbyists have even snuck their commercial interests into schools. In fact, these saturated fat-laden foods compromise health and can contribute to a lifetime of preventable illnesses like type 2 diabetes, high blood pressure and heart disease. The dairy industry is also heartbreaking for animals. Mother cows endure back-to-back pregnancies, having each of their babies taken away at birth so humans can take the milk instead. The babies are isolated and killed for veal or used as dairy cows themselves. The mothers are genetically selected to produce unnatural quantities of milk, and often suffer from painful infections (mastitis). When their bodies weaken from the demands of constant pregnancies and lactation at only about a quarter of their natural lifespan, the mother cows are killed for hamburger meat. Currently in Canada, there are no federally regulated restrictions on the marketing of food to children. But building on a strong body of evidence, in 2010 the World Health Organization (WHO) Member States, including Canada, released a set of recommendations calling for policies that reduce the impact of marketing to children of foods high in saturated fat, sugar and sodium. The Healthy Eating Consultations are open until August 14, 2017.